This collection of interviews forces us to consider that Cohen's interactions with the press are products of his public image instead of honest words that represent his core belief system. When we think of great interviewers, individuals like Barbara Walters and Charlie Rose come to mind. But what about great interviewees? 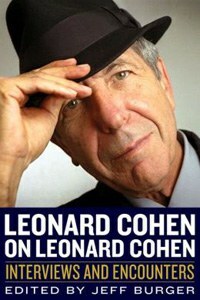 Jeff Burger’s new book Leonard Cohen on Leonard Cohen: Interviews and Encounters is a collection of more than 50 interviews Cohen conducted between 1966 and 2012, and it demonstrates, at the very least, that the legendary poet and musician is a fascinating subject. Journalism, for the most part, is about the pursuit of truth, and the challenge of this quest stems from the individual’s subjective nature. Most of us are aware that objective truths do not exist, and if they do, they are nearly impossible to obtain. Thus, while readers might turn to Burger’s book in an attempt to locate the true essence of Cohen in his own words, they are ultimately left with a calculated image that aims to provoke and perplex. Burger’s intention is to call attention to this challenge, and to show that public figures like Cohen are often “more focused on projecting a persona than on speaking from the heart” (xix). This is not to say that the interviews in the book aren’t interesting, because Cohen handles the press in a playful manner most public figures wouldn’t dare. Rather, it’s to acknowledge that we’ll most likely never know who the “real” Cohen is precisely because he is a public figure and all public figures construct a fabricated image for the masses to consume. As a result, Burger’s book is at once fascinating and frustrating. Those interested in the cult of celebrity will be intrigued by Cohen’s adept handling of the media. In many ways, he’s like Prince, David Bowie, Madonna, and Bob Dylan, in that he deliberately becomes an enigma to entice an audience. However, those who want to know Cohen will be disappointed, as the interviews illustrate how he acts for the public eye but can’t fully paint a portrait of who he is when no one is around. Nevertheless, when Cohen utters, “I have never dazzled myself with thought, particularly my own thought,” in a 1967 interview, one can’t help but be charmed by his elusiveness. After all, what is a poet without his own thoughts? Similarly, when he says, “I don’t care what people call me, whether you call it folksinging or some people call it a priestly function or some people see it as a revolutionary activity or acidheads see it as psychedelic revolution or poets see it as the popularization of poetry,” you get a sense that he’s acutely aware of how the public perceives him. It is this acknowledgment, I think, that makes Cohen a fascinating figure. He’s willing to admit that the perception of him changes with each member of the public, but by saying he “doesn’t care,” he assumes a level of superiority. Unlike other celebrities who might be plagued by how they are viewed by others, Cohen claims to be uninterested, as if he is removed from this superficiality. Perhaps he is, or perhaps that’s what he wants us to think in order to be considered a true “artist” who doesn’t care about such things. In any event, it’s an intriguing statement that causes the reader to think about the extent to which anything a public figure says should be taken at face value. For example, in another interview from 1973, Cohen claims that he is “motivated by the same ambition—greed—as everybody else,” which in many ways complicates what he says about not caring about public perception earlier. In the 1967 interview, he separates himself from others with his lack of concern for public perception, but here, he maintains that he is on everyone’s level. What, ultimately, does all of this mean? It could mean many things or nothing at all. That’s the thing about celebrity culture and the public’s fascination with it. We invest so much of our time and energy trying to figure out who these people in power are, and we hang onto their every line and gesture as if it were gospel. But what if none of it matters? What if they just make statements to provoke and capture our attention without giving them much thought or even believing in them? I’m not saying that Cohen is dishonest with the public, but it’s appropriate to at least consider the possibility that his interviews are products of his public image instead of honest words that represent his true self and core belief system. Why? Because he says everything knowing full well that his words will be transmitted to a mass audience, which by default creates a set of boundaries that are difficult to penetrate. In the preface, Burger writes, “I’ve never met [Cohen], but after reading the interviews and interview-based features collected here, I feel as if I’ve spent many revealing hours in his company over many years” (ibid.). The interviews collected herein are certainly revealing, but after thinking about them for a while, I still don’t know what, exactly, they reveal.